He heads to camp on Saturday for what he claims will be his last year at camp. I have always loved that he volunteers for MDA camp. But, I have to admit that a full week without his help will be interesting. I am lucky enough to have a husband that knows what it means to really parent. He's not just a daddy to our kids, but a parenting partner for me. I'm pretty sure I should be way skinnier than I am. I never sit down except to nurse, eat, and drive. Not to mention, it's not uncommon for me to nurse and eat at the same time. Or eat and drive at the same time. Wait, maybe I am eating more than I think. Anyway, I also do my glamorous second job like a bat out of you know where these days. This is partly because I'm no longer trying to do it pregnant. It's also because it has become the only time that I spend completely alone. I may or may not have been singing along with the Indigo Girls at the top of my lungs tonight too. That has to burn some calories right? I am giving up dairy as well. Not to get skinnier but to keep Evie from feeling like I am feeding her poison. The problem is I'm a moron. The dinner I made tonight included an entire stick of butter and I didn't make the connection that butter is indeed dairy until I had eaten a generous helping. Yes, I willingly made a meal that contains that much butter (in fact, I decreased what it called for). It doesn't happen often, but sometimes a pasta cream sauce just has to be done. Regardless, I haven't really built a case here for why I should be skinnier have I? 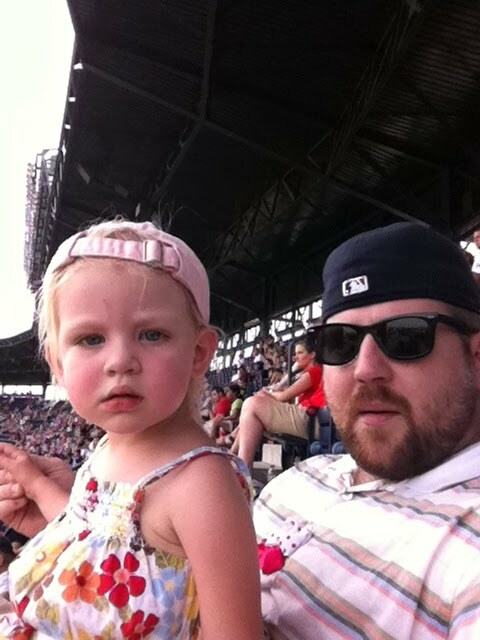 I can't remember what I've shared exactly about Lila because things happen so unbelievably fast. She is a full on conversationalist now. And not the kind that is only understood by her. It was like one day she woke up and said three complete sentences in a row and there was no going back. Don't get me wrong. I am not complaining. There is something magical about lessening the guessing game I like to call "I don't know what you want because I can't understand you!". At the same time this is just one more thing that makes her older, faster and I am in desperate need of a pause button. A few other random updates include her complete escape from the pack and play, her beautiful infatuation with her sister, and her ever growing musical talents. As I'm sure I've mentioned, Lila graduated to a pack and play before Evie was born. She (I) wasn't ready for the big bed and yet it would have been silly to buy a second crib. Then, not too long ago she graduated to the big bed but still took naps in the pack and play. This was because she refused to nap in the big bed but went to bed great in it at night. Over the weekend she escaped the pack and play. Needless to say napping AND going to bed at night have been interesting. I pretty much bribe her to take a nap. I come up with something that will happen when she wakes up and that typically works like a charm. Going to bed at night is getting more challenging, but we are working on it. I think she knows that Evie is still up (not by our choice) and she feels left out. This breaks my heart because she is SO VERY GOOD with Evie. If she only knew I would typically give anything for Evie to be asleep too. 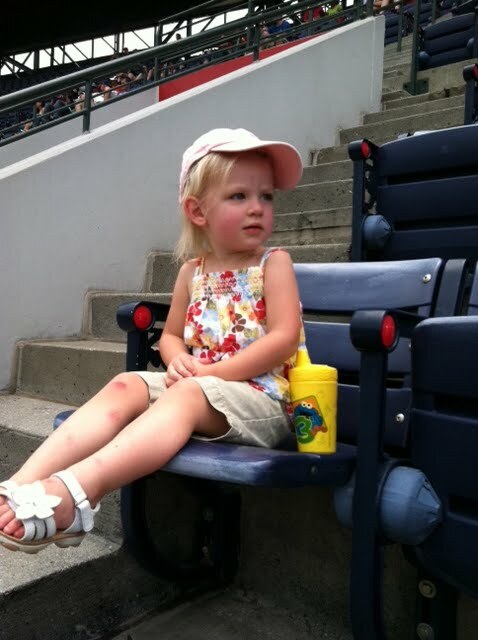 Speaking of Evie, Lila is pretty much the best big sister on the planet. She talks to Evie like Evie understands everything she is saying. She reads books to her while I dry my hair. She dances around the kitchen, stops to tell Evie to dance, pauses like she's waiting for Evie to actually start dancing, and then emphatically says "good job baby Evie!!!". She puts Evie's pacifier back in her mouth if it falls out. She brings her a blanket if I say her feet are cold. Her absolute favorite job is to get a new bib when Evie spits up all over the one she has on. I'm telling you, she's a dream. I'm pretty sure Evie entering our family has changed Lila more than anyone else. 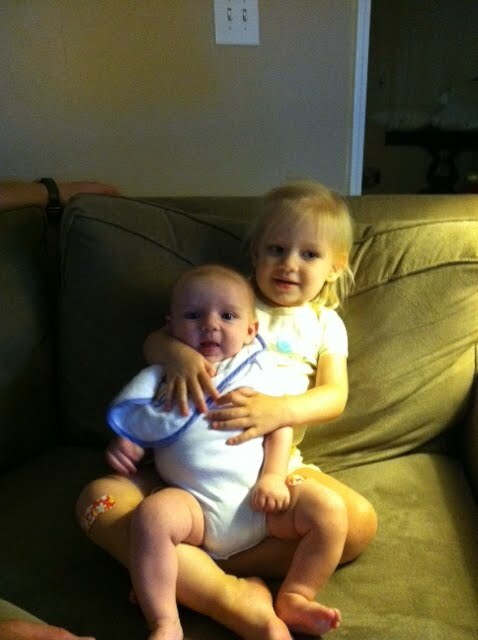 I'm not sure why, but last night was the first time we had Lila sit on the couch and hold Evie. For some reason things like that get lost in the shuffle. Anyway, you can imagine the look on Lila's face. Pictures just don't do it justice. Lastly, Lila's love for music is pretty much oozing out of her these days. All she ever wants to do is dance. She actually had a massive meltdown today because the song that was playing in the car was no longer playing when I turned the radio on in the house. And because I have no brain I couldn't remember what song it was. She acted like I had ruined her life. I'm sure that won't be the last time she feels that way. She has also fallen in love with the two guitars she got for her birthday. She is partial to the "electric" guitar, but she will take out the other one and sing a ballad or two about hairbows and flip flops. This video is long, but worth it. Seth had a hard time taking it because she would stop or walk away if she knew he was trying to video her. She will go on like this for quite a while. I was cleaning one night and Seth texted me asking who gave the guitar to her so he could adequately thank them (she had apparently been playing it for an hour and a half). Our sweet little girl had her two month appointment yesterday!!! She is still around the 100th percentile for height and weight. 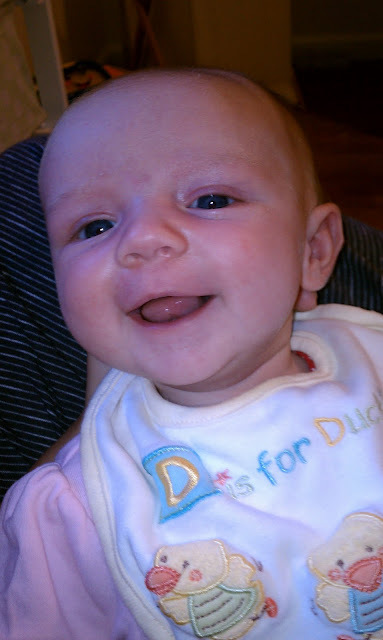 While the reflux is a daily struggle, she is such a smiley baby. 1) To take more pictures of her and not with the camera on my phone. 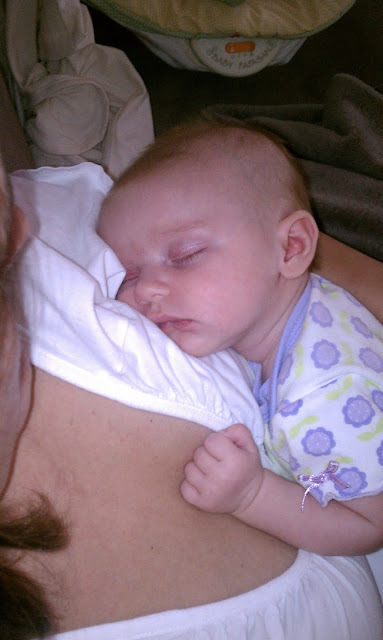 2) To let Lila hold her whenever she wants because they both love it. 3) To have her sleep on me whenever I can make it work. 4) To slow down, for her sake, and make sure she feels just how much I love her. Alright, that's about it for now. Sorry for the lengthy post but you may not see much from me when Seth isn't here! My heart pretty much melted when I read the part about the dancing. And that video is awesome. Maybe she will grow up to be a rocker chic. I love the guitar video! Lila is getting so big. And Evie is so very precious! Enjoy every second! !